Over the years I’ve seen quite a few astrology books, and some astrological websites, helping humans to better understand the personalities of their cats. In fact, Cat Wisdom 101 has a really good regular cat astrology feature. But nowhere have I seen an astrology column that helps cats understand their humans better! What to do? Well, it turns out I was in luck! My human learned to make astrological charts back in the 1980s and even did some astrological relationship work. And in the 1990s she had an horoscope column in a West Coast rock magazine. So with her help, I am putting together a monthly feature to help cats better understand their humans from an astrological point of view! I will be focusing on one sun sign each month for the next 12 months. I will describe the personality of humans born during this time, and how a cat can best use these characteristics to his or her advantage! I hope you find these columns useful. Humans born under the sun sign Aquarius are ruled by the planet Uranus, which is the planet of unexpected happenings. Aquarius humans are unpredictable, imaginative, idealistic and sometimes even brilliant! They are also a little bit nuts. There are a lot of great things about Aquarius humans. If they are cat people, they will learn everything they can about us kittiesÂ â€” and then they will take that knowledge and use it in some very strange and wonderful ways. If they are also computer geeks, they will tinker with some bit of digital paraphernalia to create a new cat toy. If computers aren’t their forte, they will still do some pretty interesting things with twist ties and pipe cleaners. Aquarius humans were probably the first to realize that cats were obligate carnivores and may have been early adopters of raw feeding. Just because something is new, Aquarius humans won’t usually be suspicious of it. In fact, more than likely, they will embrace the new and unusual. This can be lots of fun. Although the symbol for Aquarius is the Water Bearer, it is not a water sign. It is an air sign. Air signs are ruled by their minds more than their emotions, so if you are a cat who likes cuddling, you may find yourself a little wanting. Aquarians are often so wrapped up in their stratosphere of imagination that they sometimes forget you want physical attention, so you will have to solicit it. On the other hand, if you are a more aloof type of cat, the slightly distant approach of Aquarius will please you to no end. You don’t need lots of cuddles to know an Aquarius human loves you — that funny looking but irresistible toy they made for you says it all. If you do want some petting, rub up against their legs and anklesÂ â€” many Aquarians adore this. Aquarians like to think of themselves as innovative, and even rebels. But I have a secret for you: it is not a two-way street. They will admire your misbehavior if it fits in with their agenda (such as jumping on the lap of their cat-hating friend that they don’t really like all that much), but do something that inconveniences them, and they will get quite put out! So don’t be surprised if you get yelled at when you try to steal their lunch. They will not admire your ingenuity just then. One thing you will have to deal with when it comes to Aquarians: they tend to be very social. They will have lots of people coming over, or they will be going out with big groups of their pals. You may not approve of some of these friends, but Aquarians see something special in just about everybody. They are also spontaneous and not always the best at keeping a routine. All this can really keep a kitty on her toes! You may find you have to nag your Aquarius to get you dinner on time. Aquarius humans get along the very best with Sagittarius and Gemini cats. They understand the restless nature of these two feline signs quite well. Libra cats will enjoy the fun Aquarius humans make, but will not enjoy sharing them with so many other humans. Aries cats may find the Aquarius human a little on the cerebral side and not quite in tune with their instinctual nature. Surprisingly, sweet, emotional Pisces kitties may have a lot of empathy for the Quixotic Aquarian humans. Not so the Cancerian catÂ â€” the Aquarian human’s lack of routine and benign emotional neglect may drive her to tears. Routine will also be an issue with Virgo cats, although they will appreciate all the cool things Aquarian humans think up for them. Earthy Capricorn and Taurus kitties may get annoyed with the Aquarius penchant for lofty ideas that lack follow throughÂ â€” a half-built cat tree in the living room could be a testament to that. Leo cats will have to adjust to the fact that the Aquarian human’s world does not revolve around them. Scorpio cats and Aquarian humans? Watch out! The airy Aquarian may rub the intense Scorpio kitty the wrong way and fur could fly. Are you an Aquarian kitty yourself with an Aquarian human? Then you may find you have found a fellow traveler in this crazy world. Your Aquarian human will understand your quirks like no other sign would… but keep in mind that as a feline, you will still be more routine oriented than your Aquarius human, and it is up to you to keep him or her on track. The awesomest thing about Aquarius humans is that they embrace causes and want to help the world be a better place. If they become passionate about cat rescue, they will work hard to save kitties, and will often see the bigger picture when other sun signs are worrying themselves sick over minutiae. They will come up with ways to save cats that no one else would have dreamed of. If you have an Aquarius human, I strongly encourage you to get them to volunteer at a local cat rescueÂ â€” they will do a world of good! MomKatt & Morticia are both Aquarians (Feb 9). Luckily, MomKatt’s not one of those “social ones” you speak of. Too bookish. So that’s why we get lots of laptime. I didn’t know you were doing these – they’re great! Keep it up! Sparkle! You are brilliant! I love this. Long ago I had the same astrologer as Morgan Fairchild. I love reading horoscopes and this is the absolute best ever on Aquarius. I am one. Do I see a book in your future? Hope so. 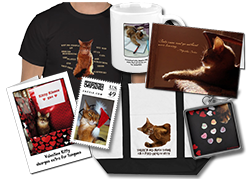 BTW – I will send you our latest cat toy. Alas it was not my idea, but came from my Aquarian partner. He is a little too close to the Capricorn end so he has less appreciation for his own idea. The kitties love it, though. Yes, this made me smile! My therapist asked me what I would be doing if I didn’t have to work and I said essentially what I am doing now, but volunteering and helping cats in need more… And my kitty crew consists of Taurus (Brighton), Libra (Coco), Capricorn (Disco), and Gemini (Sammy)…Teri wonders if she’s missing out not spending more time with Sammy! I shall look forward to the challenges of dealing with an Aries. They are so self absorbed. They just never think about how I feel! Hmmm. Well shoot. I have to wait through 10 more till you get to Capricorn. Pfft. Who wants to understand a Human anyway? What a really cool column! We kitties are sure to learn a lot from this. Thank you for your purrs for Bambino. Mom got him to eat a little bit twice today. What a great feature, Sparkle! We can’t wait until July! I think you and I (and our humans) have something in common. Goodness Gracious! A Astrologer! What a exciting life! We know people who are a little bit nuts but they aren’t Aquarians. This was very interesting though! Our mommy is a Virgo, which explains a lot. Ooooh, I can’t wait for my sign to come rolling around!! Our Mommy is an Aquarian…and you KNOW we are gonna have all kinds of fun with the “Uranus” thing!!! Our mum used to read up a lot on that thing. She is a Leo btw. Mum misses the â€˜bit nutsâ€™ by a whisker!! Such good info and very interesting. Just never thought about all this before now. Good to read about it. Take care. Excellent column! TW is Cancer and Pop is Scorpio. Iâ€™m up against some poisonous little creatures which is why I bite so much. Gotta protect myself. Can’t wait to read more of these. We have Taurus and Cancer signs in our house. 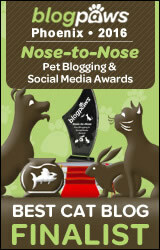 Thanks for the shout-out of my cat astrology column at Cat Wisdom 101 and Catster. I hope your human version fares well and finds an audience. Leos and Aquarians actually get along well. We can’t wait to see our mom’s sign-Gemini! 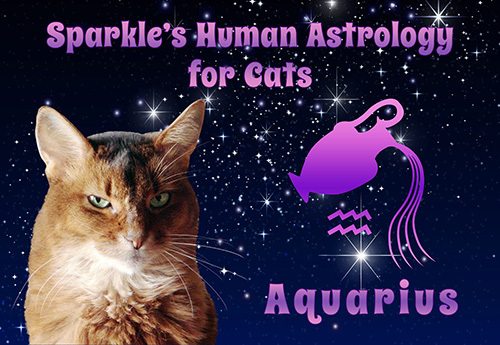 We enjoy reading astrology at Cat Wisdom 101! And we love your astrology, too! Well that was quite interesting Sparkle! No human Aquarius signs here though. Our Mom is a Cancer. Wonder what hers will read like? This is stuff we need to know, for future training purposes. I look forward to reading more of these astrology columns Sparkle. Especially can’t wait till you write about Pisces and Taurus because these are the signs of my humans. Very interesting as our Pop is this sign. Some things are spot on and other not so much. Great idea to do this! Our peeps are not Aquarians…but this is very interesting! Aquarians sounds like great cat people! We don’t know our star sign but Mum is a Scorpio so she does a sting despite being tailless! !